ESPINHO 2005 � Renowned for its vast, sun-kissed beaches and wonderful selection of seafood restaurants, Espinho is a popular holiday town in Aveiro province that has developed a reputation as a fantastic venue for the SWATCH-FIVB Beach Volleyball World Tour over the past 10 years. The 2005 Portuguese Open on the Praia da Baia features a mixed gender event as the women return to Espinho for the first-time since 2001 when Olympic and World Champions Misty May and Kerri Walsh of the United States won their first-ever SWATCH-FIVB World Tour Beach Volleyball gold medal. Situated on Portugal's northwestern coast known as the Costa Verde, Espinho is located 11 miles (18km) south of Porto. In addition to the long stretch of golden sandy beach, Espinho has a a casino, bullfight ring, a range of shops, restaurants, hotels and campsites. The town also boasts one of the oldest golf courses in the world, dating from 1890. 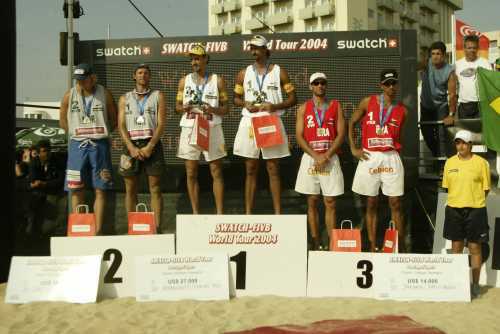 Men � Espinho currently ranks behind Rio de Janeiro (14) and Marseille (11) in hosting men�s SWATCH-FIVB World Tour events with the 2005 stop being No. 11 to tie the French city. Brazil will be seeking its eighth Espinho gold medal as reigning Olympic Champions Emanuel Rego (four, 1998, 1999, 2003 and 2004) and Ricardo Santos (four, 2000, 2001, 2003 and 2004) have combined for eight titles. The United States (two) and Norway (one) have captured the other Espinho crowns as Emanuel has earned seven overall medals and Ricardo (six), who has netted a podium spot in the last five Portuguese events. Portugal Olympians Joao Brenha and Luis Maia has posted their country�s top finish in Espinho with a fifth in 1998 as the pair has competed in nine of the events together along with Canadians John Child and Mark Heese. Emanuel ($88,650 in Espinho earnings), Martin Conde of Argentina ($61,100), Maia ($21,300) and Javier Bosma of Spain ($19,625) have competed in all 10 Espinho events. Pic (left to right): Hoidalen, Kjemperud, Emanuel, Ricardo, Marcio Araujo and Benjamin. Women � For the first-time since 2001, the women�s SWATCH-FIVB World Tour returns to Espinho. Women�s teams from the United States have won five of the previous gold medals on the Portugal coast, including four-straight as Olympic Champions Misty May and Kerri Walsh won their first ever FIVB title in Espinho. The win by Brazilians Sandra Pires and Jackie Silva in 1996 was their first stop after capturing the Atlanta 1996 Olympic Games. Ana Pereira and Maria Jose Schuller posted a 2000 Espinho seventh was the best finish by a Portugal team.